Critical Link is an electronics product development company that provides “MityDSP” and “MityARM” System on Modules and Timesys is a software company working on Embedded Linux, which provides LinuxLink, a software development framework for embedded Linux application development. 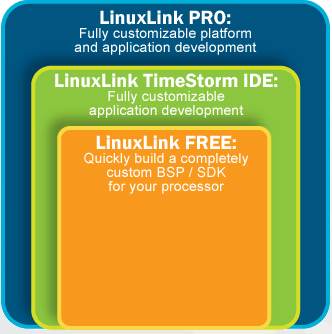 Both companies have partnered to offers LinuxLink BSP/SDK for MityARM-3359 SoM based on Texas Instruments Sitara AM335x Cortex A9 processor. Support by Timesys for build/boot issues. Critical Link MityARM 335x Demo, an image that features TI Matrix-GUI-v2 application. MityARM-335x is not the only option however, as Timesys LinuxLink is said to support over 100 embedded platforms. Further details are available on Timesys LinuxLink and Critical Link MityARM-3359 SoM page. Timesys YouTube channel may also be interesting, as they provide more tutorial and demo videos for their tools.